Pure XS Night by Paco Rabanne is the new flanker to Pure XS perfume for men coming with a more intense and more lingering aroma. 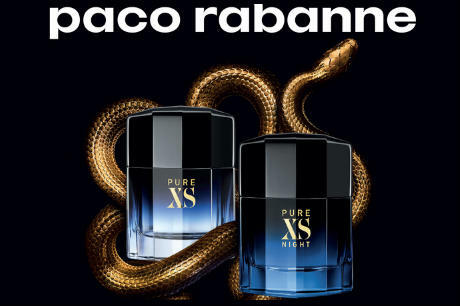 Paco Rabanne Pure XS Night is all about strong and powerful fragrance that reflects one’s lifestyle and attitude. Definitely not like a Million, which for me is an extremely strong and powerful parfum, but a manly-man scent. I adore strong fragrance, but not too pungent this is the difference between a qualitative and an expensive fragrance. Paco Rabanne is using aphrodisiac notes in its perfumes to make it the right and secure weapon of seduction. Paco Rabanne Pure XS Night will intoxicate and attract women due to its indecent beauty and pleasant singer/spicy/salty aroma seasoned with sweet vanilla and caramel notes. Anne Flipo and Bruno Jovanovic are the perfumers that created this new amazing fragrance. Stay tuned I will update with notes, later. Paco Rabanne Pure XS Night is available in 50 and 80ml Eau de Parfum.